Gary Cohn, the former economic advisor to Donald Trump, spoke with Washington Post White House economic policy reporter Damian Paletta on Thursday, June 14th to discuss the legacy of his tax reform bill, Peter Navarro’s explosive comments at the G7, trade, infrastructure, and what’s next for the former Goldman Sachs CEO. When asked by Paletta whether or not he thought the bill will eventually be revenue neutral, Cohn answered, saying “I’m going to make a bit on news here: It won’t be revenue neutral,” and suggesting that it would be either positive or negative depending on how the economy performs. Paletta asked Cohn if he could see himself coming back to work in this administration in a different role. Cohn said, “I can see myself coming back to Washington,” prompting cheers from the crowd. Bret Baier’s newest book is already creating buzz. On Monday evening, an A-list of Washington politicos descended on the Marriott Marquis at the invitation of co-hosts David & Carrie Marriott and Ande & Mae Grennan for a reception celebrating Fox News Anchor Bret Baier’s new book, Three Days in Moscow: Ronald Reagan and the Fall of the Soviet Union. 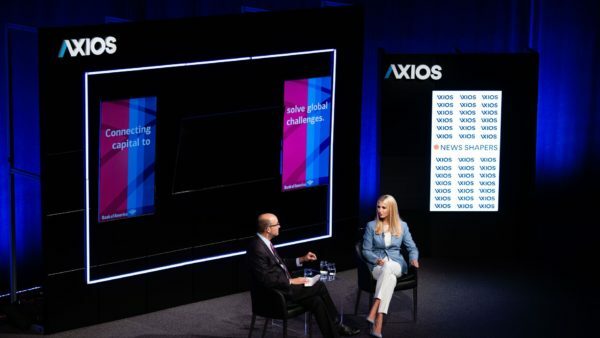 Bret and Amy Baier were joined by Kellyanne Conway, Attorney-General Jeff Sessions and Mary Sessions, Secretary of Commerce Wilbur Ross and Hilary Ross, and Secretary of Transportation Elaine Chao. Marriott Executive Chairman Bill Marriott and wife Donna entertained guests alongside their son and daughter-in-law in the hotel’s Liberty Ballroom. The reception kicked-off a two-week national book tour, which concludes just before the author heads to Singapore to cover the much-anticipated U.S.-North Korea summit. Guests included Rep. Debbie Dingell (D-MI), Azerbaijani Ambassador Elin & LaLa Suleymanov, Jordanian Ambassador Dina Kawar, Kuwaiti Ambassador Salem & Rima Al-Sabah, Barbara Allbritton, Heather Podesta, Kay Kendall and Jack Davies, Janet Donovan, Willie and Finlay Lewis, and Ryan Williams. 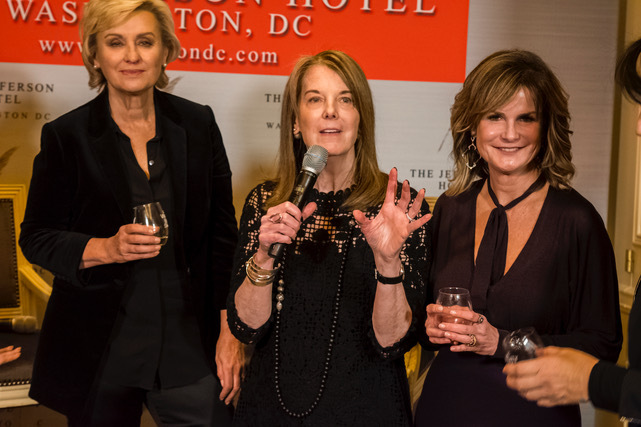 Journalist, entrepreneur and author Tina Brown delighted the crowd gathered at the Jefferson Hotel in Washington Tuesday evening, dishing about her experiences as a magazine editor-in-chief, highlighted in her newest book, The Vanity Fair Diaries. Connie Milstein, Carol Melton, Andrea Mitchell, Hilary Rosen, Gail MacKinnon, Rachel Pearson and Kathy O’Hearn hosted the book party. The biggest applause of the evening came during the Q&A session led by Tammy Haddad, where she was asked her working around men accused of sexually harassing women, including Harvey Weinstein. “The answer to creepy men is to kind of be the boss, right?… [T]he more women in power, the more women who are leading, the more women on that team, the less of these creepy, stalking harassers you’re going to encounter… I’ve been hassled in other ways, in terms of feeling like so many women feel: cut out of the action that I wanted to be in or underestimated or demeaned or whatever. I’ve had a lot of that in my career,” Brown responded. 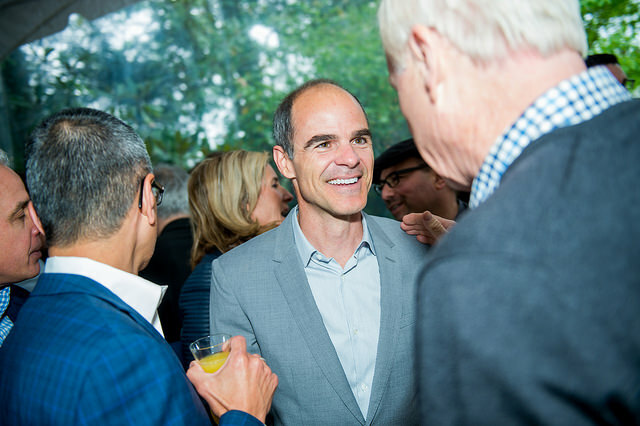 Guests included Chris and Lorraine Wallace, former House member Jane Harman, Mac McLarty, Kevin Baron, Megan Smith, Craig Gordon, John Coale, Martha Slagle, Peter Baca, Lloyd Hand, John Phillips, Linda Douglass, Robin Sproul, and Jordanian Ambassador Dina Kawar. You can read more about Tina’s book and the event in the Washington Post’s write-up of the celebration here. Brown’s newest book, The Vanity Fair Diaries, was named one of the best books of 2017 by Time, Amazon and The Guardian. It is available in print, Kindle or audiobook on Amazon. The political drama House of Cards will return for a final eight-episode season in early 2018 without actor Kevin Spacey. Netflix content chief Ted Sarandos announced Monday that the sixth season of the show will feature Robin Wright. Late October, actor Anthony Rapp told Buzzfeed News that Spacey had tried to sexually assault him in 1986, when Rapp was 14 years old. Several others then came forth with additional allegations of sexual misconduct by Spacey, including more than 20 people at the Old Vic theater in London, where Spacey was artistic director from 2004 through 2015. In early November, Netflix severed ties with Spacey. During the first five seasons of House of Cards, Spacey played the character of Frank Underwood, a ruthless Southern politician that ultimately ascends to the White House. Wright plays Claire Underwood, Frank’s wife. At the end of season five, Frank resigned from the presidency in disgrace and Claire became president. Amidst significant media backlash, the Walt Disney Company has reversed its decision to ban film critics with the Los Angeles Times from press screenings of its films. The Walt Disney Co. had revoked the Times’ access to all press briefings, an ABC website for journalists and other media events following a September story in the paper titled “Is Disney paying its share in Anaheim?” which focused on the company’s business ties with the city of Anaheim. Disney had considered the story to be unfair, and blacklisted the newspaper following its publication. In response to the blacklisting, several individual journalists, film critics and media outlets ranging from The New York Times, Washington Post and The A.V. 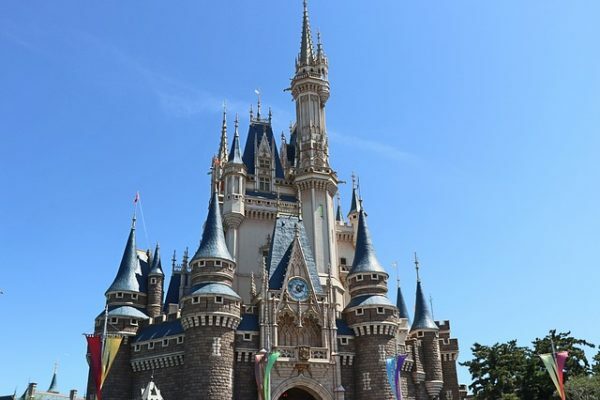 Club announced their own boycotts of advance screenings of Disney films. The A.V. Club’s A. A. Dowd wrote that the outlet took exception with Disney’s strong-arm tactics. 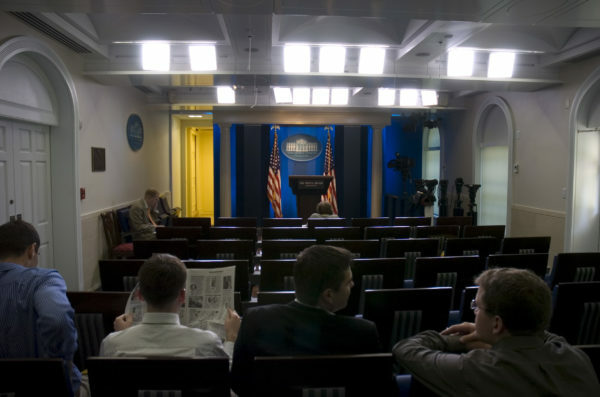 James Brady Press Briefing Room. Photo courtesy of Wikipedia. Former White House press secretary Sean Spicer regrets berating journalists during his first White House press briefing in January. During this session, Spicer had aggressively asserted the inauguration crowd size was the largest ever. “Of course I do, absolutely,” Spicer admitted during an interview Monday with the New York Times. Photos and videos of the inauguration showed fewer people gathered on the National Mall than for former President Barack Obama’s 2009 inauguration. Additionally, Nielsen data suggests the television audience for the Trump inauguration fell below numbers for both Presidents Reagan and Obama. Spicer made a surprise guest appearance at the Emmys on Sunday to make fun of this notable first briefing. Appearing at the end of Stephen Colbert’s opening monologue, the former press secretary emerged on stage pushing a mobile podium similar to one used by Melissa McCarthy in a popular Saturday Night Live skit. “This will be the largest audience to witness an Emmys, period. Both in-person and around the world,” Spicer responded to Colbert. “This was an attempt to poke a little fun at myself and add a little bit of levity to the event,” Spicer explained during in his interview with the New York Times. 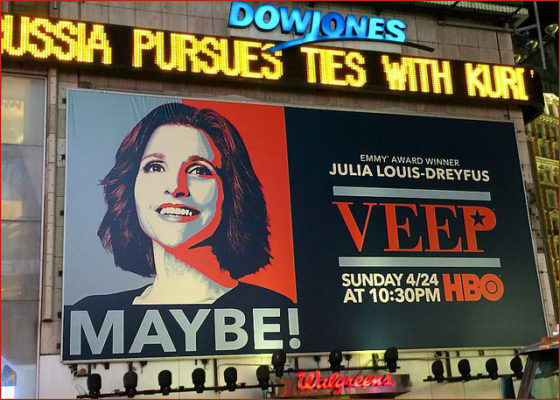 Veep billboard in Times Square. Photo courtesy Ron Cogswell. Julia Louis-Dreyfus scored Emmy history Sunday night by winning “Best Actress in a Comedy Series” for the sixth consecutive year in a row. In addition, the smash HBO series Veep, wherein Louis-Dreyfus plays ex-President Selina Meyer, took the top award for Outstanding Comedy Series for the third year in a row. In winning Best Actress this year, Louis-Dreyfus now holds the record for most Emmys won by an actor in the same role. That distinction had been held by both Candice Bergen, who won top recognition five times for her landmark character Murphy Brown, and historic Don Knotts for his portrayal of Barney Fife on The Andy Griffith Show. Louis-Dreyfus is now also tied with the legendary Cloris Leachman for most Primetime Emmys wins by a single performer. Both women have won eight Emmys. Louis-Dreyfus beat out other supremely talented actresses for the top billing in comedy: Better Thing’s Pamela Adlon, Black-ish’s Tracee Ellis Ross, Unbreakable Kimmy Schmidt’s Ellie Kemper, Grace and Frankie’s co-leads Jane Fonda and Lily Tomlin, and Mom’s Allison Janney. Her series Veep also rocked the evening by taking home their third consecutive “Outstanding Comedy Series” Emmy. Executive producer David Mandel joked about the comparison between his award-winning comedy series and the real-world White House. “I guess I’m honestly just glad that in our world Selina lost so we get to do our own show. Obviously the comparison is going to be drawn, but you’re not watching us do a scene in the Oval Office and then watching him do a scene in the Oval Office. He ends up being the 30 Rock to our Studio 60. 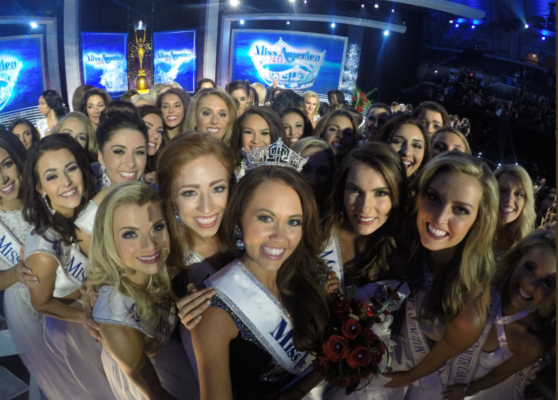 I think they’re doing a better job being funnier,” Mandel said backstage at the awards ceremony. The Emmy for Outstanding Comedy Series faced tough competition from other fantastic shows this year, including HBO’s Silicon Valley, ABC’s Modern Family, FX’s Atlanta, Netflix’s Unbreakable Kimmy Schmidt, ABC’s Black-ish and Netflix’s Master of None. Veep went into the evening as this year’s most nominated comedy series, with 17 total Emmy bids. The show has been a nominee for best comedy series every year since its first season in 2012. HBO announced earlier this month that Season Eight of Veep will be its last. The final season will air in 2018. Earlier today, Comedy Central and Trevor Noah announced that they have agreed to a contract extension to keep the popular comedian and television host behind the late night desk on the Emmy-winning smash The Daily Show with Trevor Noah through 2022. 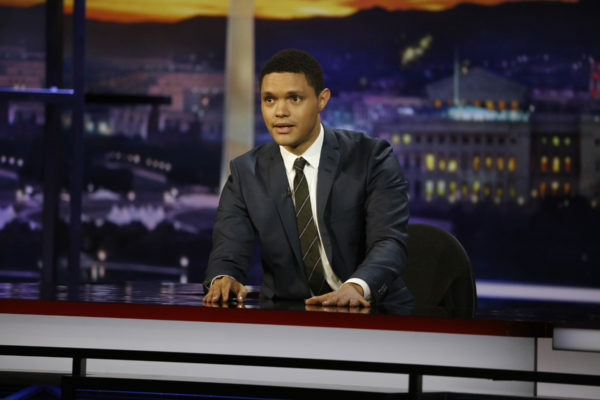 Similarly, Trevor Noah expressed his gratitude to the network and his fans for helping bring another five years of his late-night show to the airwaves. Under the contract extension, Noah will remain as host at The Daily Show through 2022, in addition to his roles of writer and executive producer. He will also host and produce year-end specials for the network beginning in December 2017. Noah has found outstanding success since joining the network in 2015, especially among millennial and Generation X viewers. In the third quarter of 2017, The Daily Show increased its viewer share among millenials an astounding 28% compared to last year, more than triple the growth of any other late night talk show. The Daily Show with Trevor Noah airs on Comedy Central Monday through Thursday at 11:00 PM EST and is available to stream the following day on thedailyshow.com and via the Comedy Central mobile app.